No matter where they travel let them know you?ll be there when they come home. 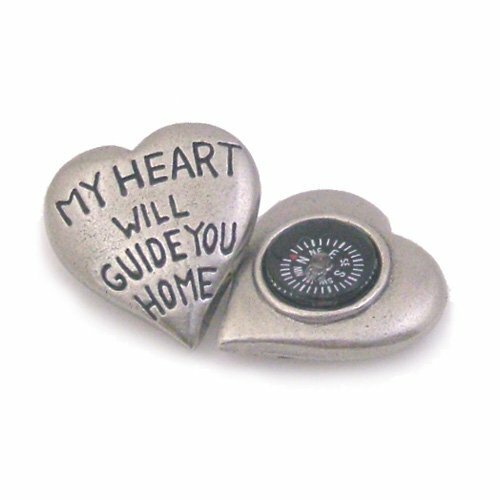 Handcrafted from fine pewter this delightful heart compass is the perfect gift for the traveler in your life. One side carries the sentiment "my heart will guide you home" the other side holds a compass. It comes in a decorative gift box, ready to give. I gave this to my hubby as an anniversary present. He is very sentimental and romantic, but not too big on having lots of *stuff*. Simply said, he loved this. It is a sweet little token that he can carry in his pocket, set on his desk, or what have you. The engraving is nicely done - clear and readable. It arrived promptly and waswell packaged to protect it but not be wasteful. As with anythimg pewter, it is soft, so care should be given in handling it. Cute little gift!